This is the polish I chose for the occasion, the dark red shimmer from the Fearne 'Midnight Manicure' Xmas box set. I regret putting on the nail decals however - they are not great in terms of size. My nails are too small/too big for the decals, I just can't get a fit :( I have done the best I can here but it's not ideal. Never mind! These were cheap from Accessorize, so if I never use them again it's not a big loss! 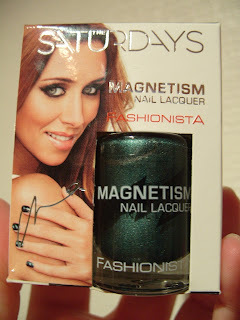 NOTD: The Saturdays Magnetic Nail Lacquer "Ego Green"
Look at that starry loveliness! My fiancee says Una is definitely nicer to look at than "Ego Green"! So, how do you use these polishes? Well, apply one coat. Let dry. Apply a thicker second coat. Be quick to put your nail right next to the magnet without touching the magnet plate. Let the magnet do it's thing for 15-20 sec. If you want to use a top coat, put the top coat on before you do the magnet - the top coat loosens the pattern a bit so you get a stronger pattern if you do the magnet after top coat! I dug this polish out from the depths of my Helmer in a desperate search for something to cheer me up as the stitches kept unravelling in my knitting... I've showed you it before, but it's worth showing again! This is 2 coats with a coat of MegaShine. I am now going back to try and finish this flaming hat that keeps unravelling! I do have loads of untrieds, and I willl need to start wearing them. But I keep going for favourite polishes which means I must be a bit under the weather :( I will make it my mission to wear 3 untrieds in a row now! NOTD: Rimmel 60Sec Stars "Be A Star"
This is one of my so-called "vintage" polishes - it's very old and fairly goopy but oh so covetable! 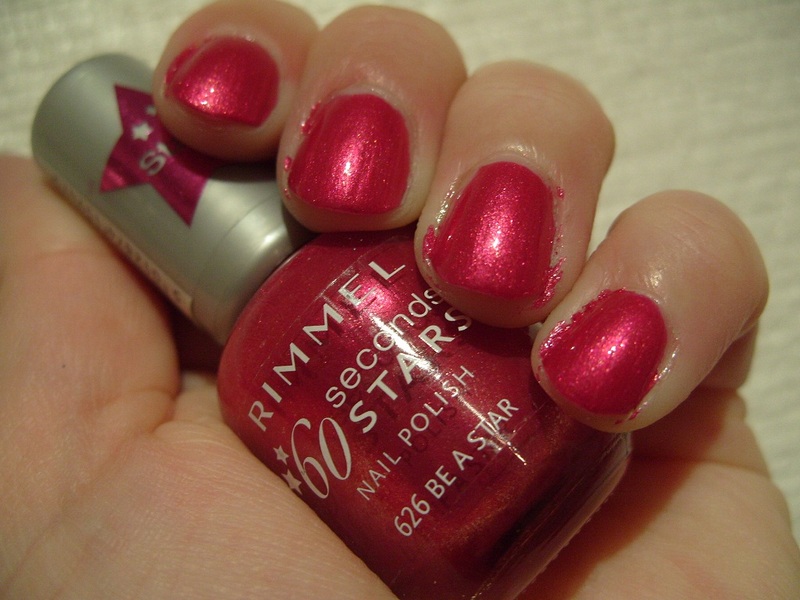 It is a fuschia shimmer with silver shimmer mixed in. This is 2 coats with MegaShine top coat. I needed something spectacular to lure me away from "Heroes of Might and Magic 6"... I found this in the Helmer but I'm not sure if I've showed this to you before? Even if I have, it's a very lovely and autumnal colour that deserves to be shown off again! Speaking of tea, has anyone tried the Bloom Tea Tea Therapy?.. It sounds healthy but I am not convinced that paying £18.99 for 50 tea bags is sensible in the long run. I think I need a bit of convincing - anyone following this tea treatment and would like to share their experience? 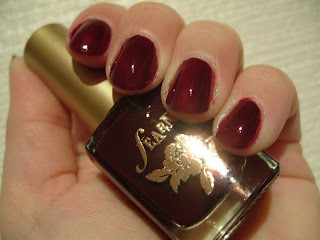 NOTD: Fearne Midnight Manicure "Dark Burgundy Red"
This is the 4th polish from the Fearne Xmas gift box "Midnight Manicure". I am just loving the whole box! :) This is a burgundy jelly, very shiny! 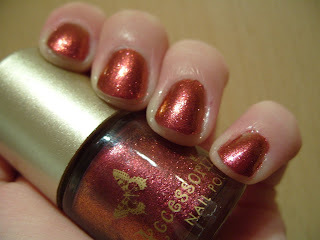 This is 2 coats, but I could've done with another coat - it's just a bit jelly sheer in places... But as usual I couldn't wait and slapped on MegaShine top coat to speed dry it. Go get it while stocks last, it will be the best £12 you'll spend in a long while! 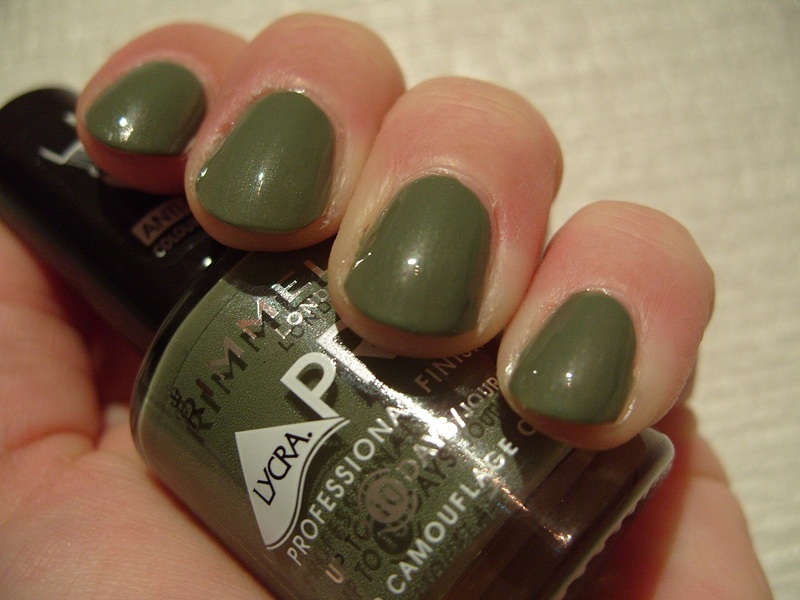 NOTD: Rimmel LycraPRO "Camouflage Chic"
I was waiting for my 'flu vaccination in Boots today when my eyes fell on this new polish from Rimmel. First I thought it was a creme. It's actually a shimmer! 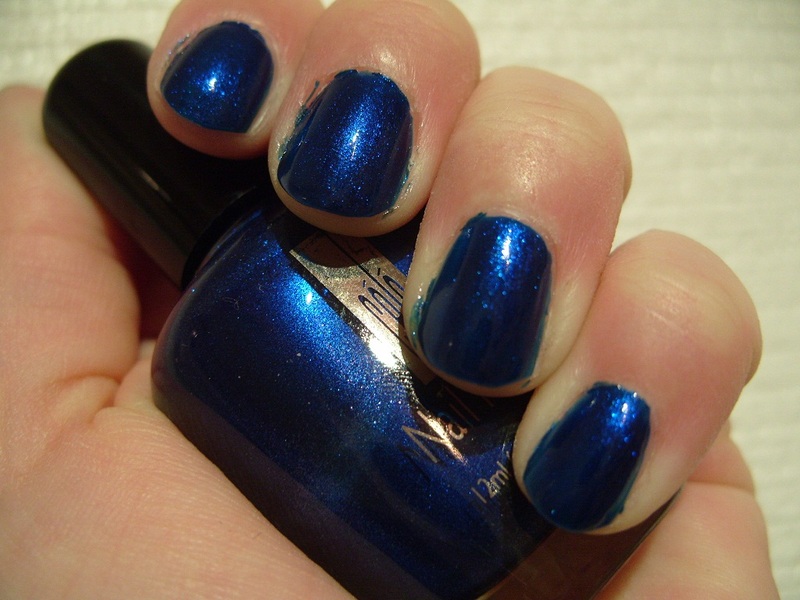 You can't really see the shimmer further away - it just gives the polish a cool blue-ish glow from within. Very cool :) This is 2 coats with MegaShine top coat.  Look how smooth the formula applies with the LycraPRO brush. I just *love* the brushes and formulas on the LycraPRO :) Just look at that swamp-green gorgeousness!! 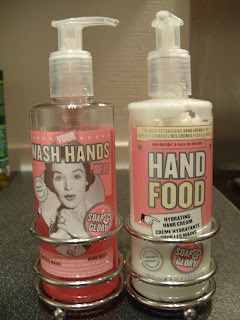 I also wanted to tell you about a great gift set for hand! Boots have started selling their Xmas gift sets (I know, it's not even Halloween yet...) and this is one of them! 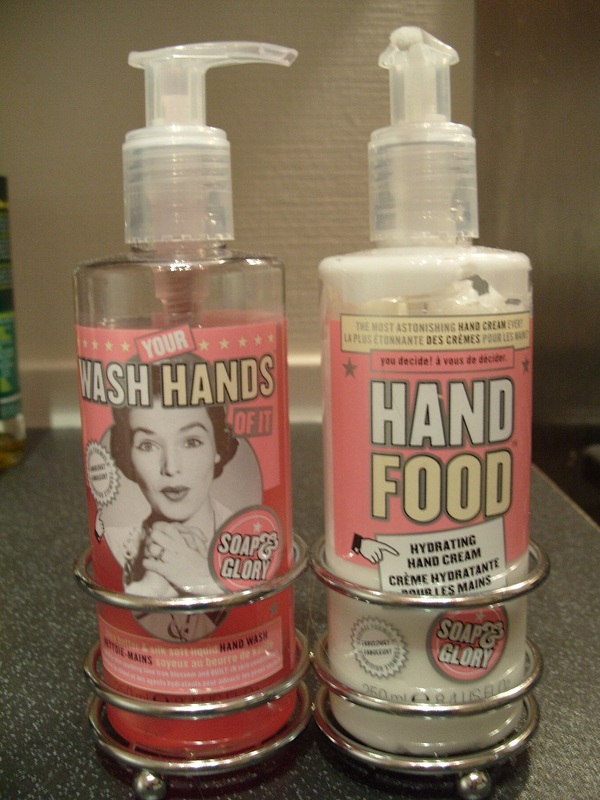 Soap & Glory's Hand Food is one of my fave hand creams, so I of course had to have this set! The soap has a complimentary fragrance to Hand Food and is very soft to lather! It looks really neat on your sink. I will refill the bottles with Hand Food and a nice hand wash when they run out as I prefer pumps to tubes! I have battled with many glitters but I must say Revlon "Facets of Fuschia" induced my first tears at struggling to remove glitter polish! Not even pure acetone and wraps helped; my nails are sore from the rubbing! It took me 35 mins to remove it... 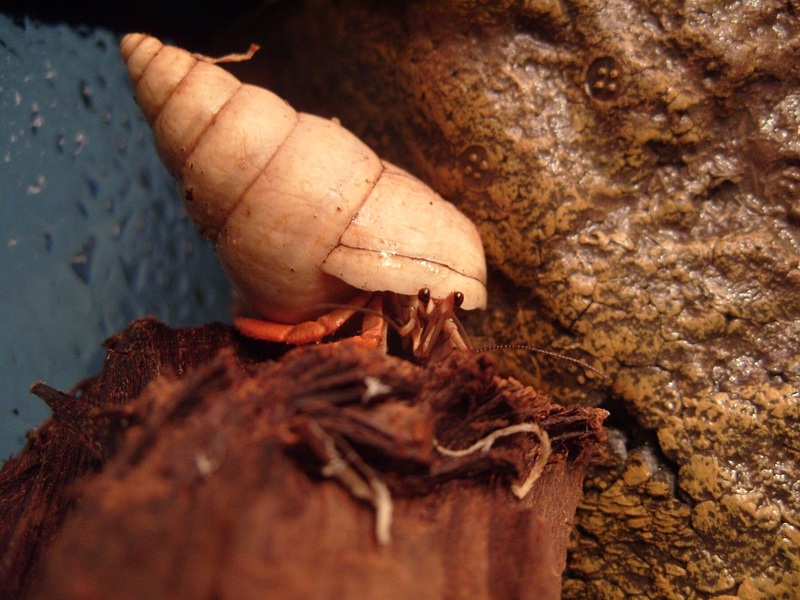 I have therefor got nekkid nails and red crusty cuticles so I am showing you a photo of one of my adorable Hermit Crabs instead. NOTD: Revlon "Facets of Fuschia"
I could have used 2 coats of MegaShine top coat to smooth down the glittery hexagons a bit more, but I needed to tidy up my invertebrate pets' tanks and put in new food so I decided it was enough fannying about with nail polish. It has still dried very hard very quickly, which is why I love speed-dry top coats! Anyway. I love the look of this polish. 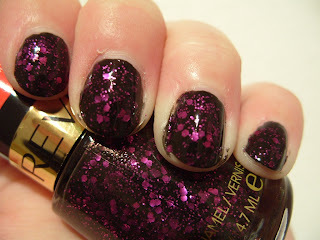 The different glittery bits are what really makes it, I have nothing like this. I was afraid the glitter may get swamped by the black and the final result would be a 'nearly black' look only. I needn't have worried! The semi-opaque mature of this polish it what makes it the sparkler it is! 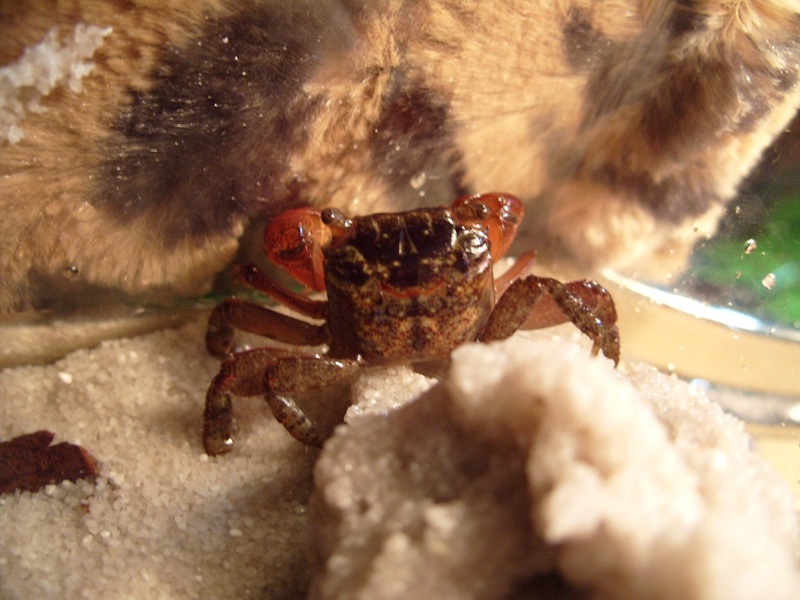 I am catching up on my dinosaur program "Planet Dinosaur" so I will leave you with a photo of my rescued Red Claw crabs - that's right they were rescued from a derelict fish tank in an abandoned tenancy! So this is another one of the gorgeous polishes from the Xmas giftset from Fearne Cotton for Boots. This is 2 coats with a slick of MegaShine. Just look at that glow!! Isn't that gorgeous??? The formula was OK, a bit on the thick side so you have to watch for brush-strokes. But I can live with that when the colour is this awesome! 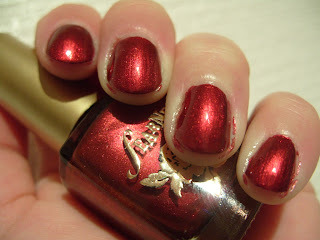 What's YOUR favourite red shimmer? ?